Whitehaven Beach is located in the heart of the Whitsundays. On the coast of Whitsunday Island itself, Whitehaven Beach is the shining gem of the Whitsundays and is one of the most iconic places in the whole of Australia. The sands are mostly void of any of nature's usual beach debris of rocks, driftwood and shells, meaning you can walk the shores in bare feet, enjoying the softly lapping water. The pure white sand seemingly stretches endlessly, an unbroken sea of white on a literal sea of blue. The surrounding islands shelter Whitehaven from large ocean swells meaning it is usually calm, waveless waters, also ideal for swimming, paddleboards or wading. Where did Whitehaven Beach begin? Whitehaven Beach is hundreds of thousands, if not millions, of years in the making. It all began when the Whitsunday Islands began to form millions of years ago. Once a mountain range, they are the product of volcanic activity, an ice age and millions of years of changing oceans and land masses. 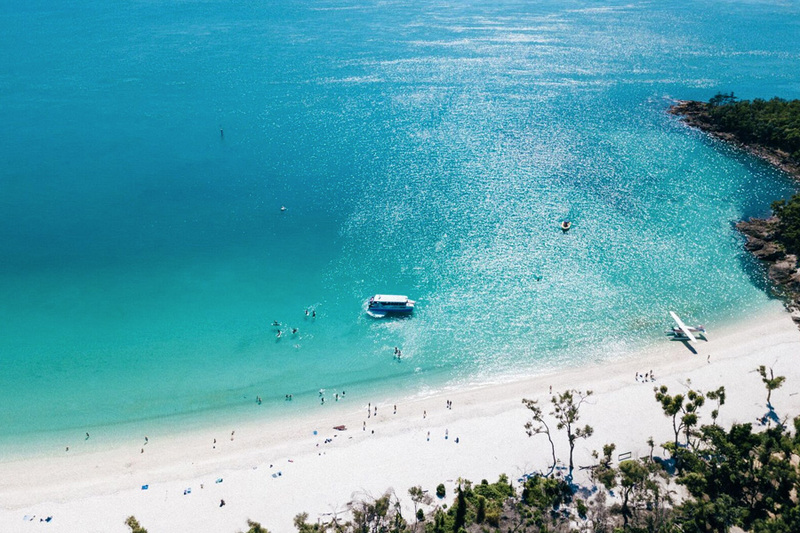 Where Whitehaven Beach lies is simply the most recent shoreline of Whitsunday Island, where the world's most fine and prized sand now calls home. How it came to be the famous beach as we know it, is a little more complicated. Whitehaven Beach is not only famous for its beauty and gorgeous backdrop, but also for its unique sands. There are billions of tons of it, stretching along the 7km shoreline of Whitehaven Beach. Whitehaven's sand is made up of 99% silica sands and are the most pure in the world. They are soft and white, and are of such quality, it is said that the glass on the Hubble is made from them. Their stark white colour and composition means that the sand does not retain heat and remains cool on even the hottest days, keep the feet of its visitors cool and comfortable. It was long thought that the sand was the product of the volcanic activity that created the Whitsunday Islands themselves. For many years, scientists had little to no idea where the sand came from or how it came to be. There are still many theories of where the sand came from, as it is formed from quartz - a rock that is not native to the Whitsundays. So if the sand is made of quartz, but there is no quartz around, how did it come to be? The newest theory is that the sandy shores of Whitehaven Beach are the byproduct of thousands of years of ocean currents that brought the sands from elsewhere in the world. The islands and headlands are said to have trapped the sand, which was made pure and free of impurities as fresh water leached it out. It is even thought that the sand may have made its way from the interior of Australia, which once had large amounts of exposed granite, which turned into sand as it was broken down. With the rise of the oceans, the sand is said to have shifted to the coast to what is now Whitehaven Beach. It remains unknown for sure how Whitehaven Beach came to be the beach we know and love today, making a visit here even more special. You can see the mystery and beauty of the beach for yourself with many day tours and overnight tours departing daily.